An innovative— even maverick—military aviator, Chennault retired from the U.S. Army Air Corps in 1937 and was hired by Chinese Nationalist leader Chiang Kaishek as his aviation adviser. During the Sino- Japanese War (which began in 1937), Chennault organized the Chinese air force and in 1941 created the American Volunteer Group (AVG), better known as the Flying Tigers, a squadron of volunteer U.S. pilots. 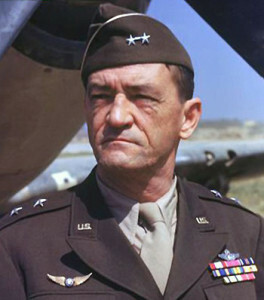 With the most modest of resources, Chennault’s aviators, trained in combat techniques he developed, achieved an extraordinary record against the much more numerous air forces of the Japanese. With U.S. entry into World War II, the Flying Tigers were incorporated into the U.S. Army Air Forces as the China Air Task Force (later, the Fourteenth Air Force), and Chennault returned to active duty as the unit’s commander. Once again, Chennault performed tactical miracles against superior forces.